Centralized, simplified security management — With the McAfee ePolicy Orchestrator (ePO) platform, you can efficiently deploy and manage your Mac, Windows, and Linux clients on your network, giving you better security visibility across your entire infrastructure. Control policy configuration, deployment, and reporting for all your endpoints from the ePO platform’s single, web-based console. Proactive threat protection — Uses heuristic analysis, generic protection, and on-access scanning to detect and remove viruses, worms, Trojans, spyware, adware, and other unwanted threats before they infect your system. VirusScan for Mac guards against Mac, PC, and Unix-based viruses. Continuous and on-demand virus scanning — Automatically scans for threats each time a file is accessed. Also scans on demand with file drag and drop. Seamless security updating — Automatically pulls the latest malware updates from McAfee Labs, our worldwide, 24/7 security research team. Although Macintosh® systems have been targeted less frequently than Windows®-based systems, they are not immune. With the number of threats growing almost daily, it is critical that you guard all of your assets—including Macintosh-based computers—from viruses and malicious code. Leverage the award-winning McAfee® scan engine with McAfee VirusScan® for Mac,® which will allow you to proactively hunt down and kill Macintosh and Windows viruses, worms, Trojans, and other threats. Automatic virus updating and cleaning protects you against infected Internet downloads, such as spyware, adware, and other unwanted threats. Users continue to work uninterrupted thanks to non-intrusive, effective protection. Trusted by educational institutions and businesses alike, McAfee VirusScan for Mac has more than 2 million users worldwide. Stop every type of virus, spyware, adware, and other malicious code that targets Mac OS X or Microsoft Windows. 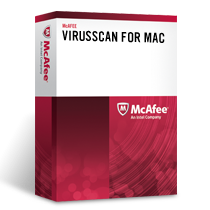 McAfee VirusScan for Mac can even detect compressed malware files and previously unknown viruses. Allow end users to operate Macs in your environment and ensure their data is protected. Get continuous policy enforcement for multiple files, directories, and volumes, including volumes on remote Macs connected through your network. Deploy and monitor VirusScan for Mac using the familiar Mac OS X Aqua user interface. Alternatively, use the McAfee ePolicy Orchestrator (ePO) platform for easy deployment, enforcement, management, and reporting — all from a single console. Check files only when they are accessed to determine whether they’re infected with malware. Initiate on-demand scanning using file drag and drop, and schedule full-disk scans to run at convenient intervals, such as overnight or during off-peak hours. Scan Apple Mail messages and attachments for threats, and protect users when they save or open files from shared network drives. Count on streaming updates from McAfee Labs — our worldwide, 24/7 security research team — to ensure full compliance and up-to-the-minute protection against viruses, worms, and other threats. McAfee VirusScan for Mac uses on-access scanning to search for viruses and malicious threats every time a file is accessed. It automatically detects viral infections as they attempt to infect a system and protects against Macintosh, PC, and UNIX viruses. In addition, it has the ability to scan Apple® Mail messages and attachments for malicious threats. It will also protect your users when they save or open files from network share drives. McAfee VirusScan for Mac uses heuristic analysis and generic detection that proactively protects against new and previously unknown viruses. The advanced heuristic analysis looks through the code in a file to determine if the actions it takes are typical of a virus. The more virus-like code found, the more likely the file is to be infected. To reduce the risk of false alarms, our positive heuristics approach is combined with negative heuristics, which searches for those things that are distinctly non-virus-like. McAfee VirusScan for Mac can be managed by McAfee’s ePolicy Orchestrator® (ePO™). ePO provides centralized deployment, policy configuration, and enforcement as well as detailed reporting for VirusScan for Mac clients. Centralized management lets your business run efficiently and cost-effectively. McAfee VirusScan for Mac uses Macintosh’s Universal Binary, which allows you to install on either Intel-based or Power PC-based Macintosh systems. Now you can get the same level of protection regardless of which processor you are running. This universal binary makes it easy to deploy; just install it and VirusScan for Mac will automatically run at peak performance to protect your systems. Schedule tasks easily with McAfee VirusScan for Mac. You will save time and help keep tasks from being forgotten. You can also schedule full disk scans to run at convenient intervals, such as overnight or during off-peak hours. The manual option of McAfee VirusScan for Mac or the scheduler task can be used to scan disk volumes and folders to search out hidden threats. McAfee VirusScan for Mac automatically downloads updates from the McAfee web site for full compliance and the latest protection against viruses, worms, and other malicious code. You’ll find it easy to schedule daily or weekly automatic updates, resulting in automatic updating and cleaning that protects against infected Internet downloads, and prevents countless hours of wasted time expended to recover and recreate lost work. McAfee VirusScan for Mac uses Apple’s Mac OS X Aqua user interface, which provides users with a familiar, easy-to-use interface. The McAfee VirusScan for Mac OS X Aqua interface makes configuration more intuitive for new users, while providing powerful and customizable options for power users. Our leading researchers combine world-class malicious code and anti-virus research with intrusion prevention and vulnerability research expertise. McAfee Labs™ protect you with cures developed through the combined efforts of McAfee Labs researchers and McAfee Labs AutoImmune technology, which applies advanced heuristics, generic detection, and ActiveDAT technology to generate cures for previously undiscovered viruses. Along with our McAfee SecurityAlliance™ partners, McAfee offers a wide variety of services to help you assess, plan, deploy, tune, and manage your security. Make sure that everything runs smoothly during and after installation with flexible programs from McAfee Technical Support. Our highly skilled and certified security specialists have a wealth of knowledge and resources to meet your security needs. Download the McAfee VirusScan for Mac Datasheet (PDF).